You might ask... It is Spring now at down-under Australia and why am I baking these autumn delicacies? I don't know! LOL!!! Maybe I just can't help it because these scones are just so good! These American Starbucks style wholesome wholemeal scones are FANTASTIC!!! So good that I can't wait till autumn or winter to bake these! 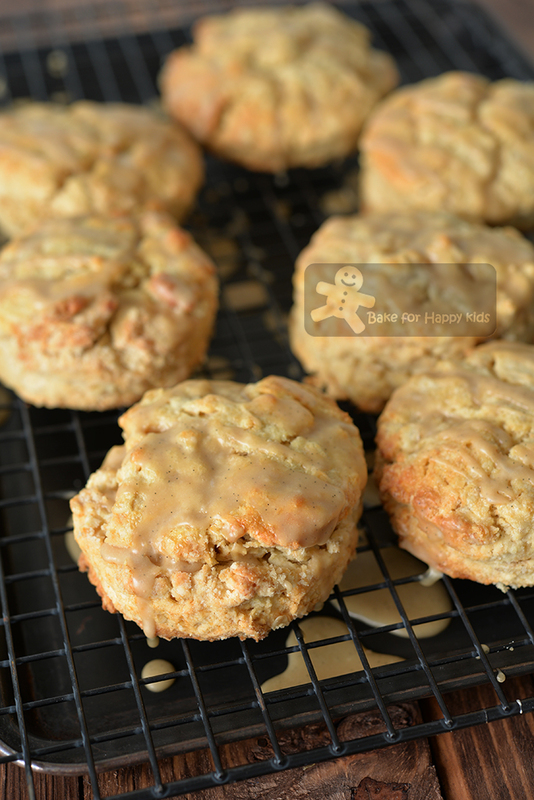 They are fully loaded with comforting maple syrup, vanilla and oats. So good and delicious that even my wholemeal-food-hating son wouldn't say no!!! What can I say? HIGHLY HIGHLY HIGHLY RECOMMENDED!!! Well, let's say that these scones are just so good... to be a timeless multi-seasonal comfort food to bake and enjoy! I'm sure all the Barefoot Contessa fans will notice that this recipe is somehow similar to the one from Food Network by Barefoot Contessa. Based on my extensive scone baking, I believe that the raising strength of self-raising flour is the best for making scones!!! And strangely, can't be replaced with plain flour with tablespoonfuls of baking powder. Due to this reason, I have replaced plain flour (all purpose flour) plus baking powder with self raising flour. 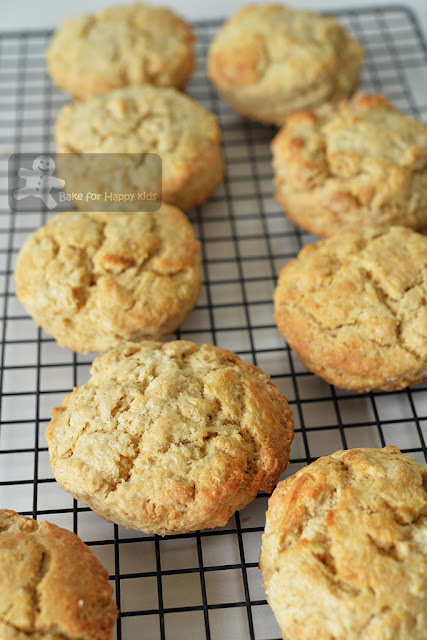 Instead of using instant oats, I have made my scones with old fashioned rolled oats and they are awesome giving my scones a beautiful rustic nutty flaky texture. Instead of using buttermilk, I have made my scones with cream resulting my scones to be extra moist and extra delicious with rich milky taste. Instead of using whole eggs, I have made my scones with egg yolks because the whites will toughen the scones texture making them less flaky. Thus, I have replaced the missing egg whites with more cream and maple syrup. Instead of using egg wash, I have brushed my scones with cream resulting the top of my scones to be crispy with a lovely flaky tender texture. 6) Scones are NOT too sweet! So YES to maple drizzle! Despite having maple syrup added into the scones, the sweetness of these scones on their own is just ok and perhaps not sweet enough for most maple-food loving people. To me, these scones are good but ideally better if they are served with a moderate amount of maple drizzle. Having said that, I reckon these drizzles can be totally optional and can be added based on individual's preference. Like the Ina's scones and unlike most American Starbucks scones, my scones have no pecan or walnuts in them. Simply because we like the scones being plain crispy and flaky with no nuts! How about yours? Would you say YES to my recipe? These freshly baked sweet-smelling scones are making my kitchen smelling so GOOOOOD!!! And their crispy flaky textures are so so so GOOOOOD too!!! 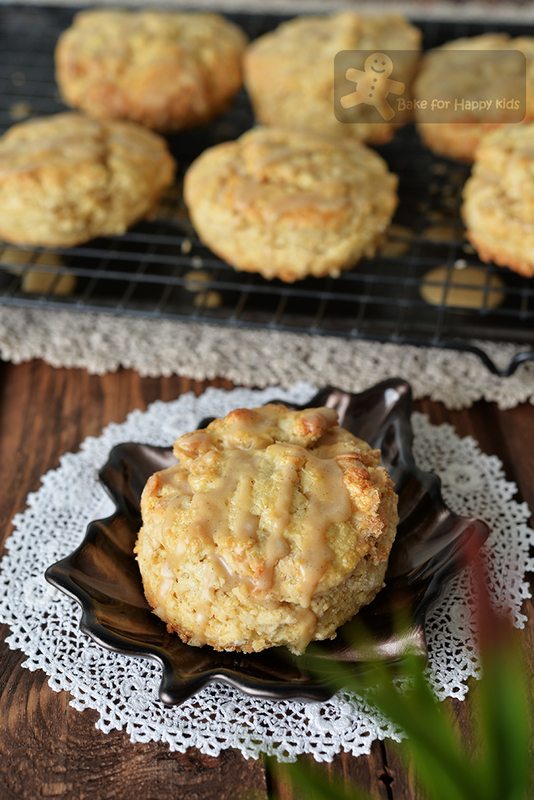 A must-try recipe if you like scones and maple syrup! Although these scones look and taste so autumn-related, I crave for them regardless of any seasons... Simply because they are so irresistibly delicious! 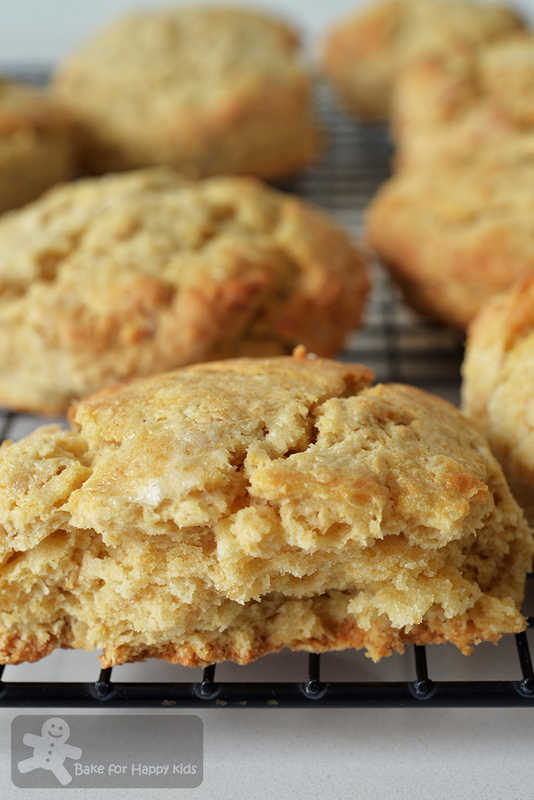 It's easy to bake these must-try scones and here's a video showing how I baked mine. I'm sure that you can bake yours with no worries too! *please DO NOT replace self-raising flour with plain flour (or all purpose flour) plus baking powder even if the original recipe says so. Please read my above baking tip. Sift both self raising and wholemeal flour, baking powder and salt into a large mixing bowl and return the wholemeal bits that are trapped in the sieve back into the flour mixture. Using your fingertips, break and rub butter into flour mixture until mixture resembles pea-size crumbs. Stir oats and sugar into the flour mixture. Combine cream, maple syrup, egg yolks and vanilla in another bowl. Use a blunt knife, make a well in the center of the flour mixture. Add the cream mixture into the flour mixture and use the knife to mix until the crumbs comes together to form a dough. Do not overwork dough. Transfer dough onto a lightly floured non-stick surface. Use your lightly floured hand to flatten the dough into a flat round with about 2-3 cm (1 inch) thickness. Use a lightly floured 7 cm round cookie cutter to cut the dough into 9 rounds and place them on the prepared tray, about 2.5 cm (1 inches) apart. It's ok that the scones are not neatly shaped because they should not be over-worked. Use a pastry brush to lightly brush the top of each scone with cream. Bake in the middle of the preheated oven for 20 mins, or until the top of the scones are golden and crispy and cooked through. It is important NOT to under-bake scones! Transfer the scones onto a wire rack and allow them to cool completely before applying the maple drizzle. Mix icing sugar, maple syrup and vanilla until the mixture is smooth with no lumps. Drizzle over the top of the scones and allow mixture to set before serving. Looks really yummy. Thanks for sharing! May I know how much self-raising flour should I use if I want to omit the wholemeal flour? Hi, you can replace 75g (1/2 cup) wholemeal flour and 1 tsp baking powder with 75g self raising flour. Cheers!